The EARTH Prime Mi5 is the go anywhere do anything all rounder bike from EARTH. This hardtail gives the best of both worlds, hitting the mountains and trails at the weekend and getting you to work again for monday. The EARTH features a clean and smooth looking intergrated panasonic lithium ion battery (36V 14A) with a handy USB port to charge smartphones. The battery goes well with the 250W rear hub motor all rolling on Schwable Smart Sam MTB tyres that are more than capable of keeping your grip on the trails and rolling fast on the commute. One of Mi5’s best features is the heads up LCD multi function display that gives you speed, distance, level of peddle assit and a battery level indicator. All which are valuable and helpful instruments that are nice to know as you ride along but there are many options to change depending on what you would like to see on the screen. Other features include Shimano cranks and gears with some good stopping power of the Tektro disc brakes front and rear. The overall weight is 21.8kg considering it is an integrated battery with all the great add on’s that will happily get you to work and through the trails with ease then we really recommend The EARTH Prime Mi5. The EARTH is also a very fast bike, looking at pushing just under 30km which is amazing for a hardtail mountain bike. 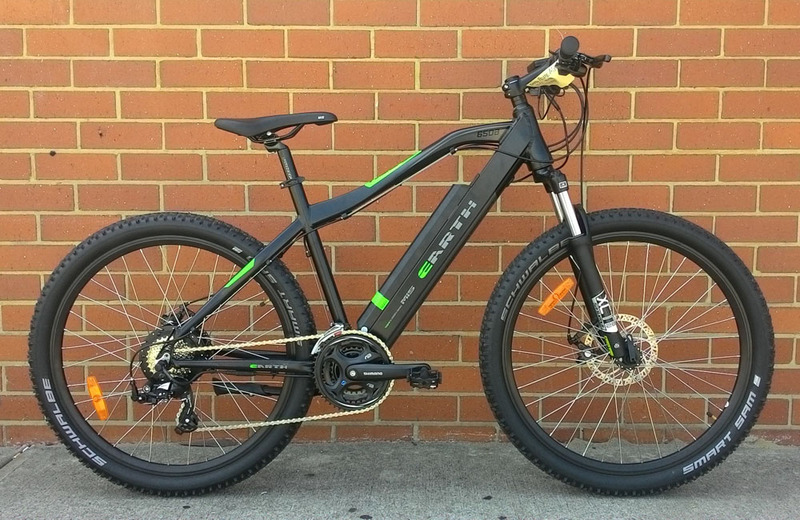 Overall this is an incredibly good value for money electric bike straight from the factory, that is not only fast but also looks great for where ever you are and what ever you’ll be doing on this EARTH Prime Mi5. Come test ride yours today at our shop in Fremantle.